Extend the use and life of your outdoor living spaces with custom canvas throughout the year. 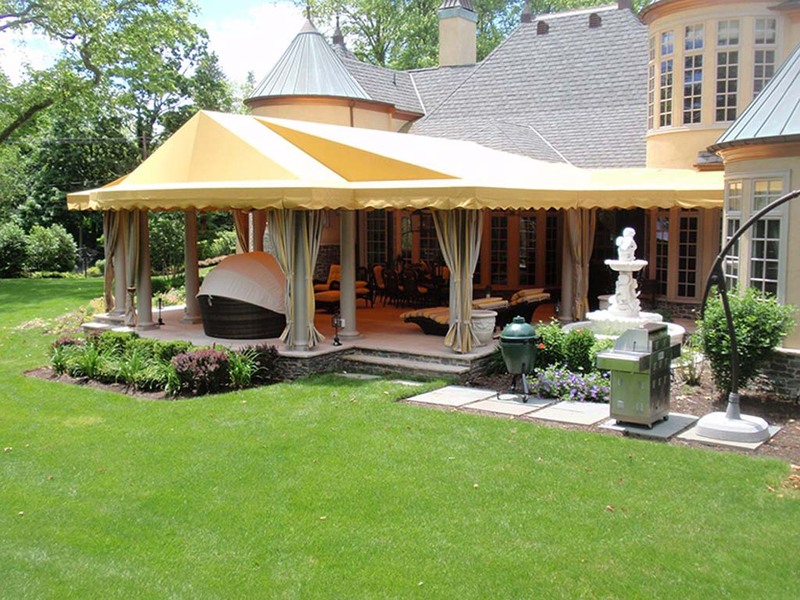 We custom fabricate pergola covers, patio awnings, and canopies to keep you cool in the summer sun. A retractable awning can offer you flexibility and comfort with some style to go along with it. When the summer is over, you don't need to abandon the refuge of your outdoor space. Let Jean's Canvas Products build a custom deck, porch, or patio enclosure for you to keep the elements out. Just contact us with photos and measurements and we will provide a quote and take care if the rest. We also provide information and support so you can complete your enclosure as a Do it Yourself project. If you need a custom cover made, Jean's Canvas Products is the place for you. Whether its a custom fountain or statue cover that you need made, or a cover for your outdoor firepit, we have a variety of colors and fabrics to choose from. Our professional staff has over 35 years experience in helping design the right cover for our customers. We are also a full service upholstery fabricator, and can repair any cushions or upholstery that you may have, or start from scratch and make all new cushions. Jean's Canvas Products outdoor kitchen and grill covers are the perfect solution for protecting your investment. We will quote a custom cover for you with a few pieces of information. Please provide any measurements and photos you may have and we will take it from there. We can cover tables, bars, chairs, chaise lounges, and just about anything else. Call today for a free estimate.